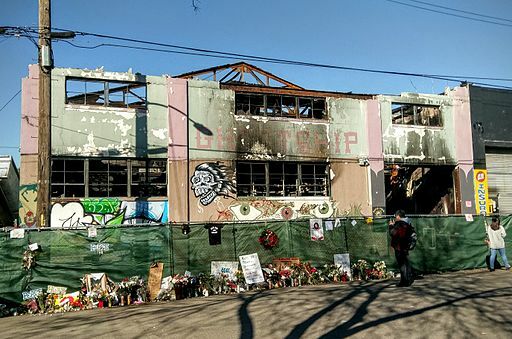 OAKLAND, Calif. (CN) — A California judge Wednesday refused to dismiss Oakland from a civil lawsuit over the Ghost Ship warehouse fire that killed 36 people, finding the city had a mandatory duty to ensure the warehouse was safe. Alameda County Superior Court Judge Brad Seligman tentatively ruled that Oakland was required to inspect and shut down the Fruitvale-area warehouse after city fire, police, and planning and building department employees learned it was unsafe, and that it was not immune from liability for failing to do so. In the hearing in downtown Oakland, Seligman also tentatively dismissed claims of city employee negligence, failure to warn and special relationship stemming from the Dec. 2, 2016 disaster. He gave the plaintiffs 21 days to amend those claims. “I can’t in good conscience say there is no mandatory duty to act under those circumstances,” Seligman said, referring to the city’s failure to act despite knowing of the Ghost Ship’s unsafe conditions. He made the same findings in November, the first time Oakland sought dismissal. Oakland is among more than 20 defendants in a consolidated negligence and wrongful death lawsuit brought by family members and friends of the people who died in the warehouse dance party. Other defendants include the building’s owner, Chor Ng, master tenant Derick Almena, and Pacific Gas & Electric, one of the state’s largest utilities. The plaintiffs, represented by lead liaison attorney Mary Alexander in San Francisco, claim the city neglected to inspect and shut down the Ghost Ship for not being up to code, though police and fire personnel visited repeatedly before the fire and knew it was unsafe, and the city planning and building department received multiple reports of dangerous conditions there. They say the building was a “fire trap” cluttered with debris, and got its power from an adjacent building via an overloaded cable snaked through a hole in the wall. It lacked overhead sprinklers and emergency exits and had only two rickety stairwells, one of which had been blocked off before the party, according to the plaintiffs. Nonetheless, 25 musicians and artists illegally lived at the Ghost Ship, and concerts were often held there, also illegally. Most people died of smoke inhalation, trapped on the second floor. On Wednesday, Oakland’s attorney Raymond Marshall, with Sheppard, Mullin, Richter & Hampton, insisted the city was under no mandatory duty to act. He said it would have been under such a duty only if a city building inspector had determined that the Ghost Ship should be shut down. The only way an inspector could have done that, Marshall said, was if the building had been inspected. But an inspection was never conducted because city employees never reported the violations, and this, he argued, exempted the city from liability under state inspection and immunity laws. “It’s clear those determinations are discretionary, not mandatory,” Marshall said. Judge Seligman was not persuaded, saying making a determination “seems to be” part of the mandatory duty. “The actual determination is not a policy decision,” he said. In his tentative ruling, Seligman found that the plaintiffs’ other claims either were not specific enough or that immunities applied. Plaintiffs said the city regularly inspected businesses in wealthier neighborhoods, but ignored the Ghost Ship due to its location in the working-class Fruitvale neighborhood. Plaintiffs’ attorneys indicated Wednesday that they may choose not to amend the claims. Seligman in September refused to dismiss PG&E from the lawsuit, finding the failure to install a separate electrical meter on the Ghost Ship may make the utility partly responsible for the state’s deadliest structure fire in 15 years. The lawsuit accuses PG&E of failing to install a sub-meter on the Ghost Ship and two adjoining buildings, and of not monitoring the flow of power to the buildings through the single meter that had been installed next door. Had PG&E monitored the flow of power, the plaintiffs say, it would have noticed the dangerous power surges caused by overloaded electrical lines supplying the Ghost Ship. That would have triggered an inspection and termination of service before the fire could happen. Although the complaint does not identify what started the fire, it suggests the overloaded lines were responsible. Federal investigators were unable to pinpoint a cause. Alameda County prosecutors in June 2017 charged Almena, the master tenant, and Max Harris, who planned the party, with involuntary manslaughter for allowing people to live and attend events at the warehouse without ensuring it was up to code. Almena and Harris pleaded not guilty. Their criminal trial is set for July 12. The civil case goes to trial on Oct. 7, 2019.